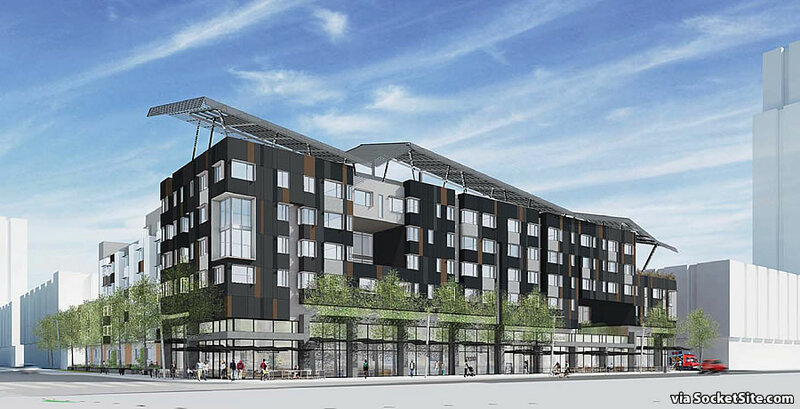 With the first two blocks of the new Candlestick Point neighborhood slated to start rising next fall, the design for one of the first 100 percent below market rate (BMR) buildings to follow has been refined by Herman Coliver Locus Architects for the Tenderloin Neighborhood Development Corporation (TNDC) and Young Community Developers (YCD). 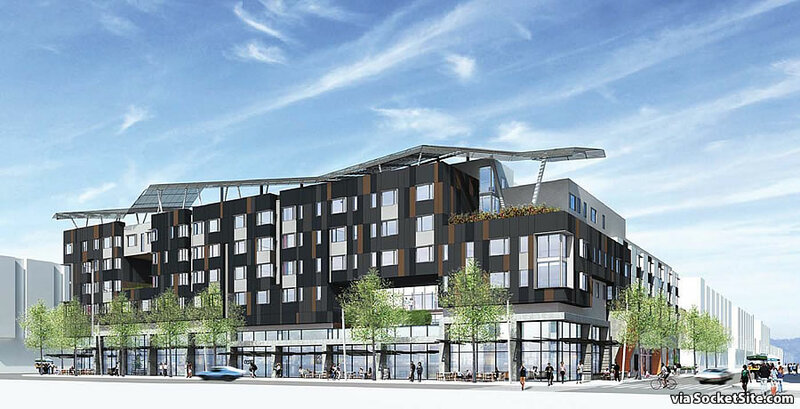 The 156-unit building will rise up to seven stories in height upon Candlestick Point North’s Block 10A, fronting the future Ingerson Avenue, between Earl and M Streets, with a 13,000 square feet of double-height retail space along Ingerson, a garage for 85 cars, and three stories of pedestrian-scaled townhouses and flats along the mid-block break behind the development. An undulating steel-framed canopy atop the building will be outfitted with a solar array to offset the building’s energy usage. And of the 156 apartments, over half of which will be three-bedrooms or larger, 121 will be made available to low income families earning up to 60% of the Area Median Income with the remaining 35 units designated for formerly homeless households. 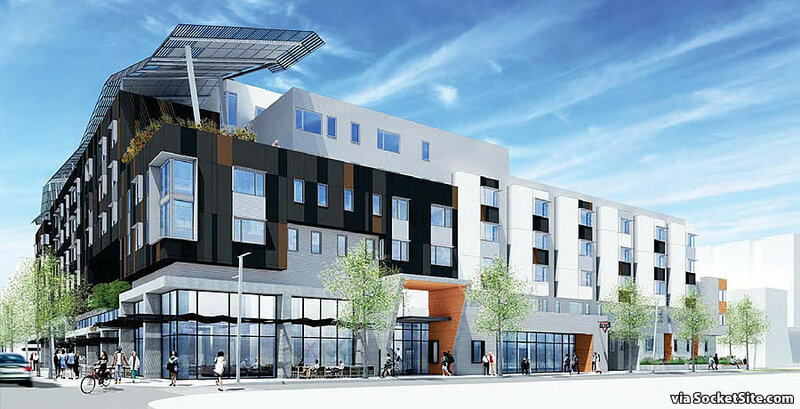 The building will include a community space devoted to Young Community Developers workforce readiness training during the day and the Bayview YMCA for afterschool programming during the late afternoon and early evening, with multiple community gardens on various floors of the development as well. And in terms of timing, with the ground lease and loan for the building not expected to be approved until the second half of 2019, don’t expect a ground breaking until 2020 or beyond. Tell me more about the qualifications for “formerly homeless”. 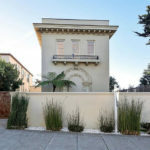 The 35 units designated for the formerly homeless will be leased through a referral process managed by the City’s Department of Homelessness and Supportive Housing. Oh, these are for lease, that makes sense. The federal building is so cool though! The building and the roof look fantastic. My gut tells me that high winds could be problematic for this roof and local birds will use it as a nesting ground, but my brain tells me that architects and developers must have taken this into consideration. My first thought was the hideous rusty “decoration” on the Federal Bldg. at 7th & Mission Sts. After reading the panels are solar I don’t think it will be bad, certainly not a rusty mess. I like the design. Yay for ground floor retail! Pains me every time I walk by Valencia Gardens or Bernal Dwellings and their dead streetscapes due to lack of ground floor retail. Something tells be that the hole in the building looking into the courtyard is going to get VE’d right out just like it did in the Trinity Place buildings. While we are on the subject of things named “Candelestick”, is there anything that still exists called “Candlestick Park” ? If not, will the signs on 101 with that designation ever be removed? Or are they just there for the sake of nostalgia? and I totally misread your post. sorry. Yes. 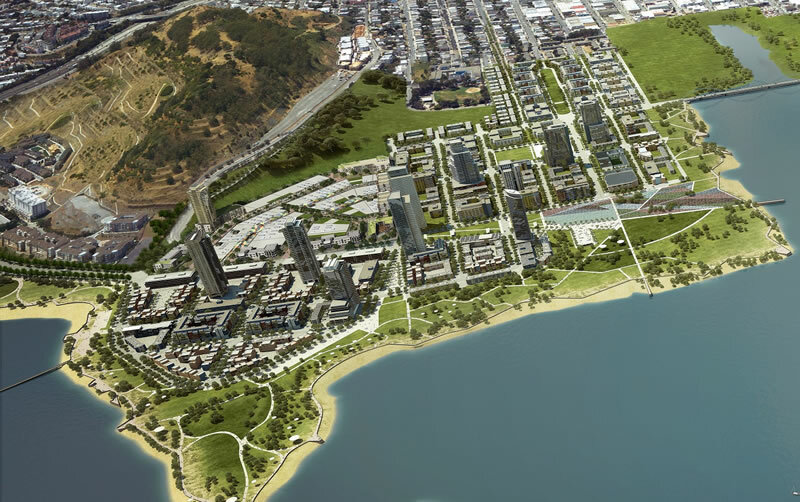 The entire piece of land is known as Candlestick Point. Yes, there is a Candlestick Park, the Candlestick State Recreation Area, first urban state park in CA. In fact, I just returned from leading a work party there for the State Parks Foundation & Literacy for Environmental Justice (LEJ), a non profit native plant nursery and employment/education internship for high school kids. We have grown and planted serval thousands of native pants there in an area called Sunrise Point that will become SF’s second campground, the first being Rob Hill in the Presidio. There’s a lot going on there now and for the future. I’ve lived a 10 minute walk from Candlestick for 36 years and watched it change.